People who visit Antarctica go there for the scenery and wildlife. Of course being able to say you've been to Antarctica sounds good too. Some of the main stream cruise lines like Holland America and Princess, as part of their South America itineraries, now offer cruises to Antarctica. But read the details carefully as those cruises are truly cruises. There are no landings and the passengers will be spending 4-6 days at sea between cruising the Drake Passage and cruising around Antarctica. All viewing of scenery and wildlife will be from the deck of a ship. We wanted more on our trip. We wanted to be able to make landings. We wanted to be able to say we had actually planted our feet on the Antarctic continent. And we wanted our wildlife experiences to be up close and personal. We investigated many options. Most of the ships that make landings have a very small passenger contingent. That is because the IAATO specifies no more than 100 people ashore at any one time. Because of economy of scale, these small ships are very expensive. We had a big surprise another day, seeing on the same ice floe, gentoo penguins and a leopoard seal. The leopard seal is a mortal enemy of penquins, literally tearing them apart. It was most unexpected seeing them on the same ice floe. Of course it's super seeing the wildlife like this. But it doesn't compare to seeing them up close. Those up close and personal pictures will be coming here soon. It’s the wind. It’s most definitely the wind. Standing on the promenade deck, forward, it’s the wind you need to dress for. Wind so strong that at times one could, literally, not walk into it, around the front of the ship. On our Antarctica trip, we were given windproof and waterproof jackets. Pre-trip instructions said to bring clothes that could be layered, which we did. Since I didn’t feel I was getting enough exercise while ashore (too busy watching the wildlife), I decided to walk the promenade deck. I dressed for the cold and the wind and met up with a newfound friend from South Africa. She has about 6 inches on me and with her longer strides, our walk was really a workout for me. Did I need all that? When standing at the forward rail, watching and photographing wildlife and scenery, you bet. I’m glad I brought every single piece. Sounds strange doesn't it. And another example of being prepared for the unexpected when you travel. I just returned from a cruise on Holland America's Maasdam. This is a lovely classic ship of about 1200 passengers and it was my second time sailing on her. As usually, the service was impeccable, the ship spotless and the food excellent. One of our scheduled ports of call was Barbados. I've been to Barbados a couple of times. Actually honeymooned there many, many, many years ago. Still, I was looking forward to the stop. The shopping is super. I love the bustle of Bridgetown. And I knew I'd be able to find an internet cafe and ease my withdrawal symptoms. With a beautiful and clear day dawning, we pulled into the harbor. I anxiously awaited the announcement that the ship was cleared and the passengers could proceed ashore. Instead we had an announcement from the Captain, explaining that due to ‘large swells’ in the harbor, we would not be able to dock and we would have, instead, a day at sea. I dashed out onto the promenade deck and peered over the railing to see what was going on. It was there that I learned that wide and deep swells had made their way into the harbor, causing a significant rock to the ship. It was so significant that two bowlines had snapped as the crew tried to tie her to the pier. Bowlines snapping?? These lines are probably 2-3 inches thick and it was incredible to think about the power necessary to cause these lines to break. While we were sadly disappointed to miss this port of call, we could certainly understand the Captain’s first concerns were the safety of the passengers and the ship. Time to head back to my cabin, grab my book and settle into a lounge chair. Should I read? Should I watch the water? Should I nap? Easy decision. All three! I’ve been reading over the specs on the Canon PowerShot A720IS . I have a Powershot A700 and I LOVE, LOVE, LOVE it. The pictures are sharp. The A700 does a fantastic job in dim light where I can’t use a flash, like museums and churches. The videos are super. So why get a new camera? Image Stabilization! Right after I bought my A700, Canon came out with an upgraded version that had image stabilization. Isn’t that always the way?? Well, I have a pretty steady hand so no problem, right? Wrong! We have done a lot of traveling since I got my camera and I can’t tell you how many of the places we visited have been WINDY. It is HARD holding a camera steady in wind so strong it could knock me over if I weighed a few pounds less. The Canon PowerShot A720IS has a lot of the same features as my A700. Two that are very important to me are a viewfinder and 6X optical zoom. An additional bonus is that the A720IS will work with the new 4 GB memory cards which means carrying around less memory cards and swapping them less often. With my daughter already laying claim to my A700, I guess it’s time to go out and buy that new Canon PowerShot A720IS . The best advice I can give about going to Glacier National Park is don’t go too early in the season!!!!! That’s the absolute best advice I can give about visiting this park. THE highlight of Glacier National Park is the Going to the Sun Road, 50 miles of two lane, twisty, glorious scenic roadway. Not only was this road NOT open when we were there in late May, but there had been winter damage that took out 100 feet of road. Anticipated opening date, because of the repairs, wasn’t going to be until after July 1. So THE reason, for me, for visiting this park wasn’t going to happen. And boy, was I disappointed! Well, time to roll with the punches. (It may seem harsh to say this but if you can’t adapt to the unexpected, don’t travel.) We now had more time for hiking and fishing. And since we were there so early in the season, the park was not crowded. At times we were the only ones on a trail, allowing us to see lots of deer. 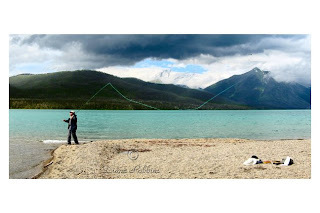 Or be the only ones fishing a piece of lake. Glacier National Park, being no different from other national parks we visited, had a glorious old lodge. With the very changeable weather, it was a great place to visit, get a cup of coffee or hot chocolate and sit and enjoy the view. We have taken many cruises and up until recently hadn’t thought about creating an Abandon Ship Bag. But a trip to Antarctica changed that thinking. A few months before we left, the MS Explorer, The Little Red Boat, sank in Antarctic waters. Did this cause us to rethink our trip? Yes, for about 10 seconds. My husband and I talked about this and discussed what we could do to be prepared if something like this happened to our ship. Our Abandon Ship Bag, left open so we could quickly throw in hat, scarf, gloves, and cameras, was kept at the foot of the bed, easy to grab if necessary, on the way out. 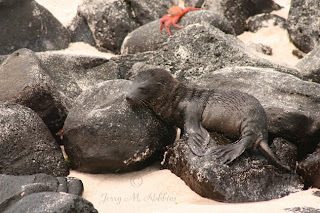 September is a wonderful time to visit the Galapagos Islands if you want to see a lot of newborn sea lion pups. September timing for our visit was pretty much accidental. It was the only time we could work in the trip schedule and airline seats using frequent flyer miles. Well, we lucked out. I have to admit, first, that there are a lot of advantages to going to the Galapagos in the spring, particularly if you love the water as much as I do. In the spring, the water is warmer. You can swim and snorkel without a wet suit. The skies are clearer and the days are sunnier and hotter. 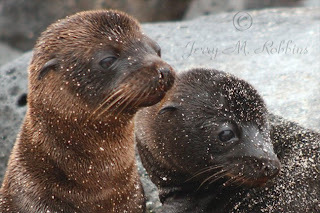 But if you want to see newborn sea lion pups, then you’ve got to go in the Fall. We saw some very young ones on every landing. We could have stood and watched their antics for hours. While the rule is to maintain a distance of about 10 feet from the sea lions, the pups don’t know that. They would consistently wander up to inspect us. One even took a liking to my sandals. 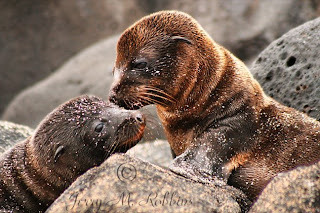 They were definitely a highlight of our trip to the Galapagos Islands. It was my job to plan a road trip. I thought I had a lot of tedious work ahead of me. Boy, was I wrong!! I was reading posts about a planned trip to Disney and sensed the excitement. And then I realized, YES, planning DOES add to the excitement. Our plan was for a 6-week cross country road trip, May/June, with no motel reservations. We had several goals: stay off the interstates as much as possible, fish for trout at some of the premier streams out west, see as much beautiful countryside as we could squeeze in. I started by getting a map of the entire US. Using two books describing the ‘best’ scenic drives in the US, I highlighted the routes on my US map. I found it fascinating, looking at all the wonderful places our country has to offer. As I ‘traveled’ along my US road map, using the internet, books and old articles I had saved, I had fun ‘poking’ into small towns, unusual museums, stately bed and breakfasts. It soon became almost a game, trying to find the hidden gems. What else was out there that I hadn’t found? What special places and things would be discovered as we traveled? How exciting the planning became! Another important part of the planning was figuring out daily mileage. It’s relatively easy to figure mileage using an interstate. But for a road trip like this, I needed help figuring mileage on the small, two lanes, twisted roads we anticipated traveling. For help with this I turned to the AAA website and its Triptik® section (you don’t have to be a member to use this tool but you can’t save your routing if you are not). It calculates point to point mileage based upon destinations you enter and/or routes you designate. This tool was extremely valuable to me, also alerting me to mountain passes that still might be closed that early in the year. Finally, we were off. Did we keep to our planned agenda? Basically, yes. But did we really want to skip Craters of the Moon National Monument? NO! Did we pass streams that my husband just HAD to stop and fish? Yes! Did we pass outlet malls I had to shop at? YES! Getting home 4 days later than planned, having driven just over 10,000 miles, it was a FANTASTIC trip. The time spent planning this road trip was well worth it and definitely added to the excitement. As part of a September, 2007 trip to Peru, we spent two nights in the Peru Amazon Basin at the Refugio Amazonas on the Rio Tambopata. 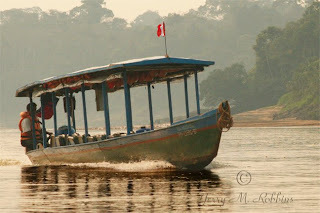 Our flight from Lima took us to Puerto Maldonaldo where, after a 45-minute dusty and bumpy bus ride, we boarded a motorized canoe. The boat ride, with stops to view the wildlife, took about 4 hours. When the boat was moving, the air temperature was delightful. But as soon as the boat stopped, so that we could view wildlife, it got HOT. There was absolutely no breeze. Humidity was as close to 100% as it could be without actually raining. We’ve experience heat before but nothing compared to this. 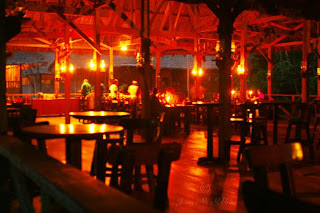 We arrived at the Refugio Amazonas lodge after dark and dinner was waiting for us. No rest for the hot, tired and weary. With electricity only in the main building, and used sparingly, we were guided to our room by a lantern lit walkway, where we splashed some water onto our faces. We then returned to the main building and dining room for our buffet dinner. After dinner our agenda was to peel off our sweat-soaked clothing and jump into the shower. The description for our lodge had included the following caveat: no hot water. Oh no! But now, after this long, hot ride, the thought of a cool shower was YES! Our room was rustic but lovely. No screens and open to the jungle but each bed had netting. The hammock looked very inviting and I knew I’d be checking it out during our visit. But, for now, it was time to jump into the shower. I peeled and headed to the bathroom, a candle in my hand lighting the way. A small shriek from me and a ‘Honey, get your camera!’ brought my husband running. In my shower was a palm-sized tree toad. Of course I knew my husband would want a picture before I shooed it away. The shower was wonderful and then time to crawl under the netting for the night. Dressed in an absolute minimal amount of clothing, and not needing the bedclothes, it was a long, hot night. I’ve been involved with the American Red Cross blood donation program since college. It has continued throughout my adult life. I have probably donated gallons over the course of 40+ years. So imagine my consternation when I walked into the local blood drive and found out I couldn’t give. Why? Because, within the last 8 months, I had visited a place that is known to have malaria. I had to wait a full year, from my return, before I could donate again. And I'm certainly not the only one. This article at HighBeam describes how the availability of donated blood in our country suffers significantly because of this. For more information on blood donation criteria, see the American Red Cross Blood Donation Eligibility Guidelines site. Travel Wish Lists Are Like Explosives! My travel wish list is like an explosive, like a gas under pressure. When released, it expands and keeps expanding, with nothing to control it. I would like to see polar bears in the wild while there still ARE polar bears in the wild. I could visit Churchill Manitoba Canada and take a tundra buggy tour or I could take an Artic cruise. Or maybe I should do both? I want to ride the train across Australia, from Sydney to Perth. Yes, it crosses a lot of barren area but those of us who like trains go for the RIDE. I want to visit the Winter Palace and Hermitage Museum in St. Petersburg and cruise, from there, through the canals and Volga River to Moscow. And as long as I’m on the topic of trains and Russia, I think I’ll add a trip on the Trans-Siberian Express to my list. I read The Path Between the Seas: The Creation of the Panama Canal, 1870-1914 by David McCullough. Now my travel wish list includes a cruise through this engineering marvel and witness it at work. It’s winter where I live and cold and snowy. A cruise around the Tahitian Islands and swimming in the clear, blue, warm waters sounds very appealing just about now. As long as I am writing about clear, blue, waters, I should add my desire to sail along the Great Barrier Reef, the longest living barrier reef in the world. I want to visit Botswana and Namibia. Why? Just because. I would like to visit some of the temples of Southeast Asia. Thailand, alone, has over 18,000 temples. In Vietnam, the temples have a strong Chinese influence. I wonder what makes each one different? I want to fly around the world. I want to sail around the world. And when I’m done with that, I’ll probably still have some items on my travel wish list. What would a visit to Peru be without visiting Inca ruins and learning about the Inca civilization? The Inca civilization lasted about 100 years and it is amazing what they managed to accomplish in that time. Since the Incas left no written accounts, what we know about them is surmised from the ruins that have been left and the written accounts of Spaniards, who eventually became their conquerors. It appears that the Incas regarded knowledge and intelligence very highly and adapted the best of each culture they conquered, incorporating that knowledge into their own culture and for their own use. Supporting this is evidence that Inca princesses and princes were not the result of, literally, a royal family but were, instead, the most intelligent among them. Among many Inca ruins that we visited, two stand out: Ollantaytambo and Machu Picchu. Machu Picchu is well known and has long been thought to be a major Inca site. That thought is beginning to change. Machu Picchu is located at the beginning of the Amazon Basin and the premise, now, is that it was nothing more than a trading post for the products brought from the Amazon area. 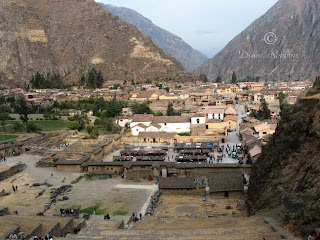 As ideas about the purpose of Machu Picchu change, so have the thoughts about Ollantaytambo, the only location where the Incas won a battle against their Spanish invaders. It is now speculated that Ollantaytambo was a very important site, both a citadel and a fortress. It is very impressive with its two hundred steps, leading up to a fantastic view of the Inca town and the valley beyond.